This story was updated at 11:02 a.m. ET. CAPE CANAVERAL, Fla. – It's the last landing day for Discovery, NASA's most traveled space shuttle, and the spacecraft is now headed back to Earth to cap a 27-year spaceflight career. Discovery's STS-133 mission will end when the shuttle's wheels roll to a stop for the last time, capping a prolific career that saw 39 flights in 27 years. After landing, the orbiter will be retired from service, and will eventually be placed on public display in a museum. 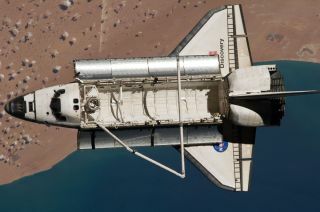 "I think the legacy that she leaves behind is quite incredible, " shuttle astronaut Michael Barratt said of Discovery, adding that the spacecraft has been "space-kindly" to its crews, largely due to the team of engineers that maintains the ship. "Even though it's the last time, we really do look forward to bringing her back to her home port and back into those caring hands." NASA expects good weather for Discovery's two landing windows in Florida today. After an early wakeup call this morning, the crew began landing preparations at 6:53 a.m. EST (1153 GMT). The doors of the shuttle's payload bay were closed at 8:12 a.m. EST (1312 GMT). The astronauts then fired Discovery's orbital maneuvering system engines for about three minutes, in what is called a deorbit burn. This slowed the shuttle down enough for it to begin its hour-long descent. Discovery is NASA's oldest and most-flown spacecraft, and at the end of its career, will have logged about 148 million miles (238 million kilometers) worth of travel. The STS-133 mission is Discovery's 39th and final flight. NASA launched Discovery's final mission on Feb. 24, after months of delays owing to problems with the shuttle's external fuel tank. The 13-day mission to the International Space Center delivered supplies, hardware, a new storage module and a humanoid robot assistant to the station and its residents. Two remaining shuttle missions are planned – Endeavour's STS-134 flight in April, and the very last STS-135 mission of Atlantis in June. Both missions are headed to the International Space Station to put the final touches on the $100 billion orbiting laboratory. Tomorrow, Endeavour will roll out to the exact same launch pad used by Discovery to launch its own mission. Endeavour is slated to blast off on its final trip to the space station on April 19. The launch pad move is due to begin tomorrow night at 8 p.m. EST (0100 March 11 GMT) and will be broadcast and webcast live by NASA. "The legacy for the shuttle fleet and the shuttle program undoubtedly, in my mind, will be the space station," NASA's mission management team leader LeRoy Cain told reporters yesterday. "We could not have assembled this marvelous facility in orbit without the capabilities of the space shuttle." You can follow SPACE.com Staff Writer Denise Chow on Twitter @denisechow as she covers Discovery's final space voyage from NASA's Kennedy Space Center in Cape Canaveral, Fla. Visit SPACE.com for complete coverage of Discovery's final mission STS-133.